The 2016 United States presidential election in New Jersey was won by Hillary Clinton on November 8, 2016, with 55.5% of the vote over Donald Trump's 41.35%. New Jersey's 14 electoral votes were assigned to Clinton and her Vice-presidential running mate Tim Kaine. New Jersey's presidential primaries were on June 7, 2016, with the Democratic, Republican, and Libertarian parties participating. Registered members of each party could only vote in their party's primary, while voters who were unaffiliated could choose any one primary in which to vote. Clinton won 7 of 12 congressional districts. 41% 56% Frank Pallone, Jr.
13% 85% Donald M. Payne Jr.
Hillary Clinton's 55.5% of the vote was 2.9 percentage points less than Barack Obama's win in the state in 2012. This was the first time since 1976 that New Jersey did not vote for the same candidate as neighboring Pennsylvania. ^ Green papers for 2016 primaries (D) (R). Retrieved 2016-04-05. ^ a b "Official List / Candidates for President / For PRIMARY ELECTION 06/07/2016 Election" (PDF). NJ.gov. April 14, 2016. Retrieved 2017-11-04. ^ "Official List Candidates for President For GENERAL ELECTION 11/08/2016 Election" (PDF). 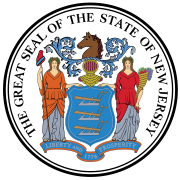 New Jersey Secretary of State - Division of Elections. August 12, 2016. Retrieved November 9, 2016. ^ "Official List Candidates for President For GENERAL ELECTION 11/08/2016 Election" (PDF). New Jersey Secretary of State - Division of Elections. December 6, 2016. Retrieved December 6, 2016. ^ "Presidential Results by Congressional District, 2000-2008 – Swing State Project". www.swingstateproject.com. Retrieved 7 April 2018.